Jose Mourinho has set tongues wagging once again by predicting that, once he vacates his post at the Bernabeu (his contract runs for another three years), his next job will see him returning to England’s fair shores – claiming that he and the Premier League have ‘unfinished business’. “I didn’t want Chelsea vs Inter [drawn out last season], because last season it was difficult to play against Chelsea. I did it, and I did everything I could to help my team, but I was not comfortable. I don’t like to play against my friends. “Any team is difficult and any team is a motivation for us. Tottenham are a good team: they beat Inter, they beat Milan, they have ambitions, they have a very good team and a good manager. Fergie out, Mourinho in? You know it’s going to happen. Nah, I reckon he’d love the drama – and if not he, then who? i would love for it to be chelsea however, who else can take over at united apart from him? Mourinho wants Old Trafford so bad he can taste it. Mou has to understand that United is bigger than he is, and if he is going to take the post once Sir Alex retires, he needs to play the United way in order to be successful. If he’s willing to do that, I’d welcome him with open arms. If not, he won’t last. man utd for sure he is! iv got the gut feeling that when redknapp goes to take the england job. mourihno will come in for spurs. My guess is that Jose will either take up Chelsea again, Arsenal should Arsene decide to try out the France NT, or Man U. If he doesn’t take up the United post and Redknapp doesn’t take up the England post, I could see old ‘arry in charge at triffic trafford. they need to make an “odd couple” remake with mourinho and redknapp in it. the hilarity would be awesome especially since they would pick on wenger. This story is featured on all the main news sites and none of them are suggesting that he may in fact be coming back to England to manage the English team? Seems obvious to me as the world cup is the only trophy he’s missing at this stage. 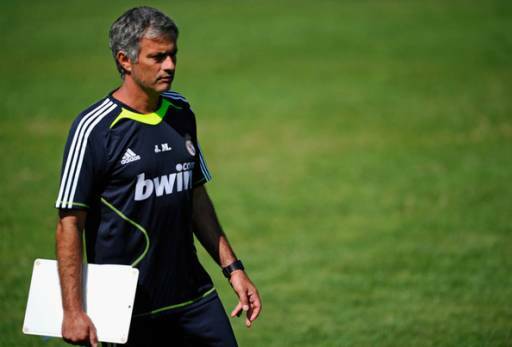 Mourinho has already stated that he doesn’t like the NT coache’s life, at least in the next few years. The man lives with controversy, so he would be bored to death… And also he already said he would like to train a national team, but that would be in his 50’s, as they basically do nothing. Besides, I believe he said at some point that he would like to train the portuguese national team and that NT coaches should be from the own country. As for what he said, I also think he will train Man Utd as he’s the only person I’m seeing with the profile and the curriculum. he only qualify for aston villa only.. sorry jose, im talking the truth, dont kill me..